Students of Government Sadiq College Women University listen intently as USEFP advisers give out information about higher education opportunities in the U.S.
USEFP recognizes that access to information about U.S. higher education is a privilege enjoyed by few in Pakistan. As such, it aims to offer services that bridge the information gap and make education in the U.S. a possibility for everyone. 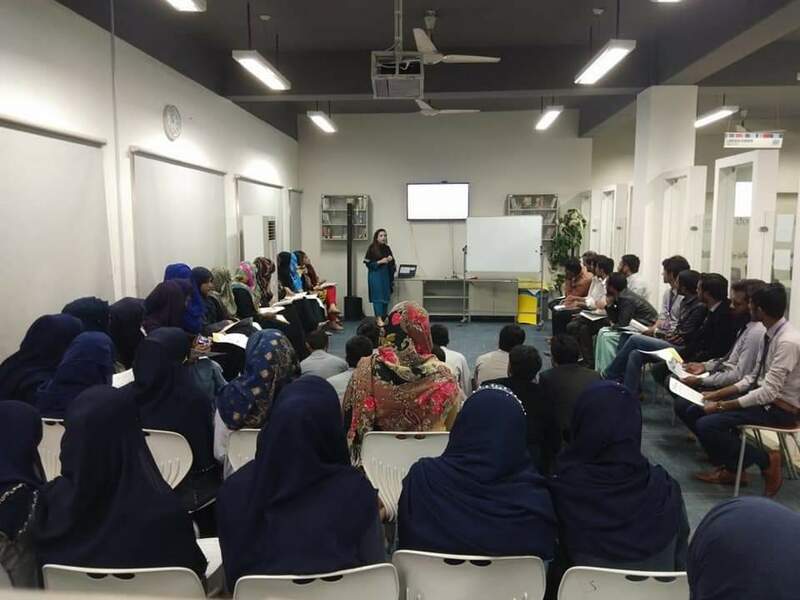 In addition to its scholarship opportunities, USEFP’s EducationUSA advising centers play a vital role in disseminating accurate and reliable information about education in the U.S. through outreach and information seminars held across Pakistan. These outreach not only introduce students to the different services offered by USEFP, but also drive home the message that studying in the U.S. is an attainable goal provided the student is prepared and focused. One of these efforts is the Test Prep initiative, which was started about six years ago by USEFP. In this initiative EducationUSA advisors visit different cities across Pakistan, especially those underrepresented in higher education. The initiative is completed in three phases; the first phase focuses on information sessions about USEFP’s flagship Fulbright program; the second phase emphasizes the importance of the GRE test through workshops; the third and final phase, is where students take the GRE mock test. The top three scorers of the mock test, those with a cumulative score above 300, are offered a free voucher to take the actual GRE test. The free vouchers are a big incentive for students who otherwise are determined to apply for the Fulbright but cannot afford the exorbitant test fee. In March, USEFP’s EducationUSA advisors from Lahore, visited South Punjab, and conducted outreach at Bahauddin Zakariya University, Multan, Government Sadiq College Women University, Bahawalpur, and Khawaja Fareed University of Engineering and Technology, Rahim Yar Khan. The advisors conducted GRE workshops at these local public-sector universities, which were attended by over 500 students. The advisors first visited the Lincoln Corner at Bahauddin Zakariya University in Multan where almost 100 students attended the workshop, followed by a visit to the Government Sadiq College Women University in the city of Bahawalpur. The advisors relayed positive impressions of the diligent and skilled female students of the latter university who are determined to obtain a graduate degree and carve out a better life despite all odds. These students also gave the advisors a tour of the city, with its rich cultural and architectural heritage. The advisors ended their outreach in South Punjab at Khawaja Fareed University of Engineering and Technology in Rahim Yar Khan, where almost 200 students attended the GRE workshop. A common sentiment that the advisors observed during the outreach was students’ fear of the GRE General test. One of the prerequisites to admission in post-graduate programs, the GRE is seemingly also one of the most challenging parts of the application process for Pakistani students, often deterring students from applying altogether. One of the first questions that advisors are asked is whether the test is mandatory – positive affirmation disappointing even the most determined students. USEFP hopes to bust some of these myths about the test as well as the application process through its annual workshops and outreach, aiming to familiarize students with the test, and most importantly to encourage students that studying in the U.S. is not beyond their abilities and intelligence. Only through phase one of the Test Prep initiative, USEFP has reached almost 9,000 students all over Pakistan since October of last year, and we hope the numbers will continue to grow. USEFP operates EducationUSA Advising Centers in Lahore, Islamabad, and Karachi, which are part of a global network of hundreds of advising centers in more than 170 countries around the world supported by the U.S. Department of State. All of USEFP’s EducationUSA advisors have first-hand experience of studying in the United States and provide accurate, comprehensive, and current information for no cost about how to apply to U.S. colleges and universities through one-to-one advising sessions and various programs and events addressing the application process.